The kind of fishing they were doing at the Sea of Galilee didn’t involve a hook. They weren’t trying to catch one fish at a time. Simon (aka Peter), Andrew, James and John were casting their weighted nets wide, and then jumping into the water to close the net and pull it into the boat. They were catching all kinds of fish; fish of every size, age, and shimmering color. 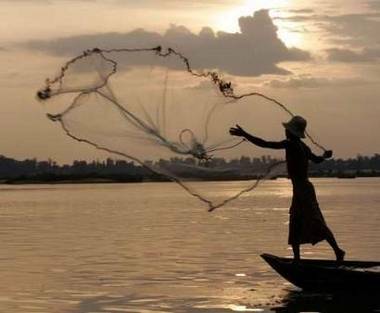 The wide-open, energetic casting of nets was what Jesus called them to do on land, with people. The image of a net provides a picture of how people are knit together in a community like church. When the new disciples left their boats behind to follow Jesus, they still cast out and gathered nets by feeding, healing, inviting, praying and preaching. What would the fishermen think was good news? Why would they follow Jesus? What other stories do you know about the Sea of Galilee? We are like the fisherman, holding those same nets. One way to demonstrate this is to do an activity that shows how we are connected. Get a large ball of yarn and arrange your group in a circle (more or less). Have one person hold the end of the yarn, and toss the ball to someone on the other side of the circle. They hold onto the yarn near them, and toss it across (but not to the person who threw it). Keep doing this until a large net (web) is created. Have everyone hold onto the yarn, and have a conversation about the exercise, community, etc. Then have the last person throw the yarn to the second-to-last until the ball retraces the same path and all the yarn is rolled up. This entry was posted in Ordinary Time and tagged Andrew, James, John, Peter, Sea of Galilee, Simon, Sons of Zebedee. Bookmark the permalink.